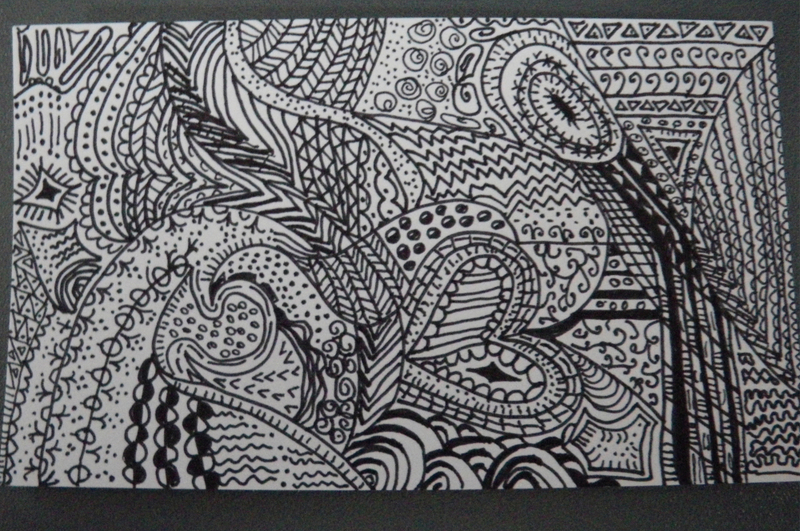 By now, most people I know have heard of a zentangle. It’s a form of doodling that I saw most of my friends doing when I was in 5th grade (a moderately long time ago). Now it is back with a name, websites, blogs, you name it. It can be commercialized doodling or just plain doodling. I’ve been wanting to try it , but I never found the time. Well, today, we were an hour early for our flight from BWI to Portland. I thought, hmm…this might be relaxing to try before the flight. It really was relaxing and there is no wrong way to do it. I mean, it IS just a doodle. Want me to mail you some Islesford, Maine starter? The tangles will definitely get into the jewelry somehow…. did you ever get the photocopier to make tear-aways? I never got the copier, though Jackie said to send her the copies any time I want and she would send me some toner copies. I haven’t worked on anything for textures, yet. I’ll probably ask her to do it again when I have some drawings. Then, if I think I’ll do more I might get the copier. Have you liked having yours?